Few advantages are as sought after by parents for their children than an education that will enable them to grow professionally and enjoy the benefits such an education can help bestow. 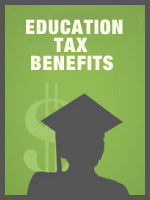 The federal government supports and encourages their efforts to provide that education through various programs and income tax incentives. Deductions available for student loan interest, tuition and fees. Explain the federal income tax rules applicable to student loan interest, payment of tuition and fees, and student loan cancellations and repayment assistance.